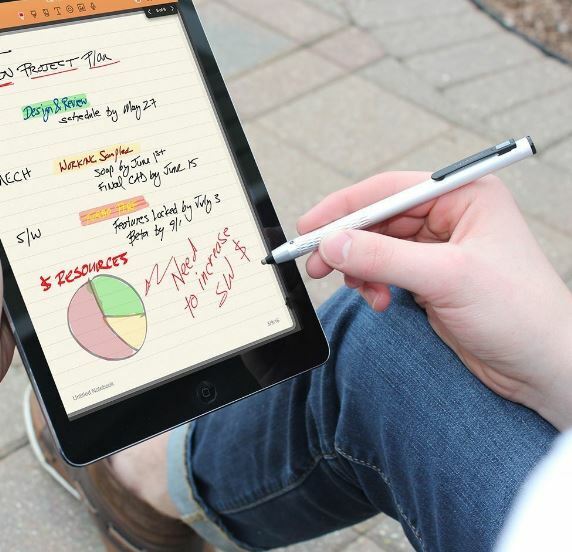 When the first touchscreen devices hit the market, a stylus was the must-have accessory. These older devices couldn’t function without them, and the screens were not sensitive enough to work well when use provided input with our fingers. These screens were known as resistive touch screens, and were considered by many to be far from ideal. With modern capacitive displays, we’re all comfortable with using our hands for input. For almost every day to day task, our fingers seem to do a pretty good job. It’s not until we attempt to do any precision work that we start to wish we had a way to enter data a little more accurately. With the iPad pro and Microsoft’s new Surface, it’s clear that touchscreen inputs are beginning to be used by both artists and professionals alike. If you’re looking to take your mobility game to the next level, there’s nothing better than a stylus. A stylus gives you a much more natural way to input data. Not only can a stylus be used just as easily as a pen, but you’ll be able to change your input based on the amount of pressure you use. There are hundreds of styluses available on the market, but almost all of them are nothing more than inexpensive toys that produce sub-par results. If you’re serious about getting a stylus, you’ll want to take a look at one of the best fine point styluses currently on the market. After releasing a number of different styluses over the years, Adonit realized that they’d have to take a different approach. Their older models used a unique input method that required developers to create apps specifically designed to support their stylus. Out of the 1.5 million iOS apps on the market, only 30 were ever updated to support the platform. With the Jot Dash, they’ve modified the system to be a little simpler. Today, it’s capable of working with every single app on the market. This alone is pretty impressive, but the question we set out to answer is how well it cooperates with these applications. We’ve tried a lot of different styluses, both electronic and non-electronic. Often, we’re forced to make a trade-off. Electronic styluses produce a much more realistic effect, but are much more cumbersome and unattractive compared to their non-electronic counterparts. Fortunately, the Jot Dash gives you the best of both worlds. At 10mm in diameter, this stylus is no larger than a standard pen. But it’s not just the size that makes this stylus stand out. It’s also the visual appeal. From a distance, it looks pretty much like a normal pen. But it’s all-metal body seems simply premium in your hands, and the sharply angled clip gives it a nice little bit of contrast. This certainly isn’t a stylus that will stand out in a crowd, but up close it’s something to be appreciated. Using the Jot Dash is incredibly easy. On the top, you’ve got a simple button. Press it once, and the stylus will come to live. You’ll know it’s powered on thanks to the tiny green LED light located right by the shirt clip. At this point, you simply use it on your phone or tablet as if it was a standard pen. Using it feels almost like a standard pen. The only difference we noticed is the slight “click” you feel as you push the tip into your display. It’s so minor that you could easily miss it, but does give you a small tactile response to let you know that you’ve made contact. If you’re using it for note taking or writing, we found that our handwriting wasn’t really effected by the stylus. There is, certainly, a small adjustment going from the friction of a piece of paper to the smooth motion of glass. However, we still were able to create very detailed drawings without much of a learning curve. The battery on the Jot Dash is capable of running for up to 14 hours at a time. For most people, this means that you’ll get several days’ worth of usage on a single charge. In order to save the battery, it automatically turns off after 30 minutes of inactivity. In our opinion, 30 minutes is a reasonable amount of time to automatically shut off. You won’t pick it up, suddenly frustrated that your pen isn’t writing. However, the battery lasts so long that you won’t notice any significant drain even if you forget to turn it off. Recharging the Jot Dash is easy. It includes a compact USB charger that looks a lot like a tiny flash drive. On the top, there is a little circle. All you have to do is insert the stylus into the circle and plug it into any USB port. It can charge from completely empty in under an hour, so we highly doubt you’ll ever be caught without any battery. The Jot Dash is very durable. It’s significantly stronger than any other pen we’ve used. For day to day use, we see no reason why you’d ever have to worry about damaging it. Throw it in a bag, in your pocket, or anywhere you like and it’s certain to hold. The only thing we would recommend you’re careful with is water. It’s not completely sealed, and it is a battery-operated device, so some around liquids is recommended. 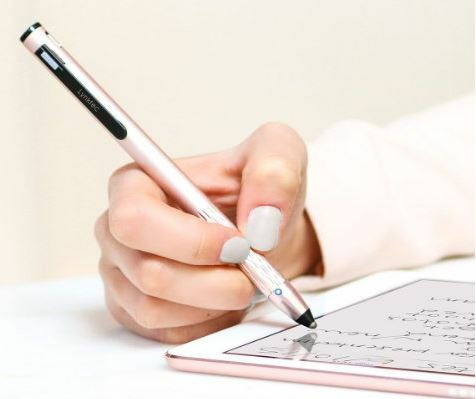 Another company that has consistently produced excellent styluses, Lynktec is also entering the market with a model that is compatible will all capacitive displays. This one comes with a slightly more attractive design that some, ensuring that it will stand out against any typical pen you might be carrying around. 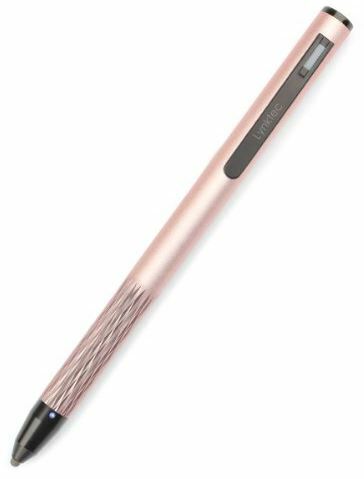 The Lynktec Apex Fusion is a fine point stylus shaped the same as your standard pen. It measures just a hair under 6” long, ensuring that it will be comfortable to hold and easy to use. It’s available in four attractive metallic colors. These colors included black, gold, silver, and rose gold. If you’re comparing it to the rose gold that Apple produces their iPhones in, you’ll find that this one is much more of a pink. But for us, we really enjoy the vibrant look of the stylus. A stylus offers you so much more than a standard pen, and you can tell this just by looking at the Lynktec Apex Fusion. There have been many styluses that come and go, but none can come close to rivalling this model in terms of visual appeal. One of the most striking features doubles as both a design and a functionality element. The area where your fingers grip the pen is coated with a cross hatch pattern, giving it a very modern, attractive look. There is a bright LED at the base of the pen, indicating blue when it’s powered on. The first Apex stylus made a name for itself in 2014 when it pioneered the TruGlide tip. This tip is made from a special polymer fiber that find the perfect balance between smooth motion and tactile feedback. You’ll probably find that it’s much more similar to writing on paper when compared with other models, but you won’t find it catching or snagging itself on the screen. But this isn’t the same TruGlide technology we found in the very first pen. It’s been updated to offer support for any capacitive device. 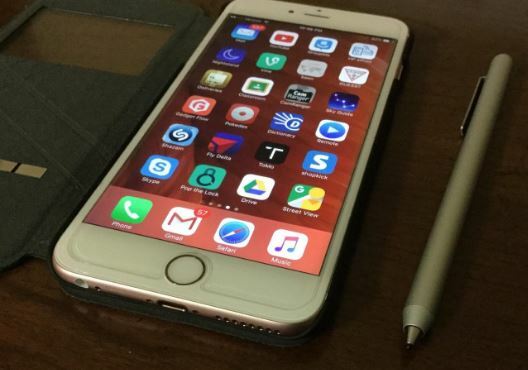 This means you’ll be able to use it whether you’re an Apple, Android, or Microsoft fan. The tip itself is only 2mm in diameter. This means that you’re able to create very precise drawings, almost as fine as a mechanical pencil. Here is the problem, Apple displays won’t recognize tips smaller than 4mm. So how can this issue be corrected? A special electronic circuit is used that creates a larger capacitive field beyond what the tip would create on its own. This circuit also has logic correction built right in, so your drawings can be as accurate as you’d like them to be. The stylus is 1 cm in diameter. This is identical to most ball point pens on the market, so we were able to pick it up and start using it right away. There was no awkward adjustment period, we were simply ready to go. It feels very natural. Anyone who’s used a pen before would agree. The only difference between this and a typical pen is that you need to turn it on. The power button is located at the top of the shirt clip, and power is indicated with a bright blue LED right near the tip of the pen. Just like the previous stylus, this one provides users with 14 hours of standard use. In our tests, this proved to be accurate. On the side of the pen you’ll see a standard Micro USB charging port. You can use this with any phone charger, or with the included USB cable. Micro USB is a little more universal than the proprietary chargers, so you can rest assured that you’ll never be stuck without battery. This pen is very lightweight, and its metal construction is perfect for withstanding the daily abuse it’s bound to be subjected to. Even when we subjected it to excess force, it didn’t give in to use attempting to bend it, break it, or force it in any particular direction. The tip, although it creates a much more realistic drawing experience, is a little softer than most. This means that, over time, it will eventually wear out. Fortunately, there is a solution. The company made the nib replaceable, so you can simply throw a new one in after a year or two. This significantly improves the longevity of the device, allowing it to last a very long time with minimal maintenance. Which Fine Point Stylus Should I Buy? Not sure which one is right for you? These two styluses represent the best models on the market. Depending on what you are looking for, one may be better than the other. In our opinion, the Adonit Jot Dash 3 would be our first recommendation. The tip doesn’t provide quite as realistic a feeling, but you’ll quickly adapt to it. 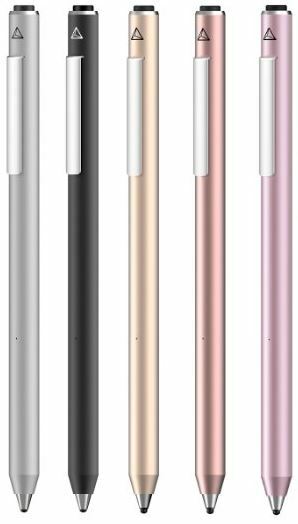 The stylus is a little more solid than its competitor, and the design a little more professional. 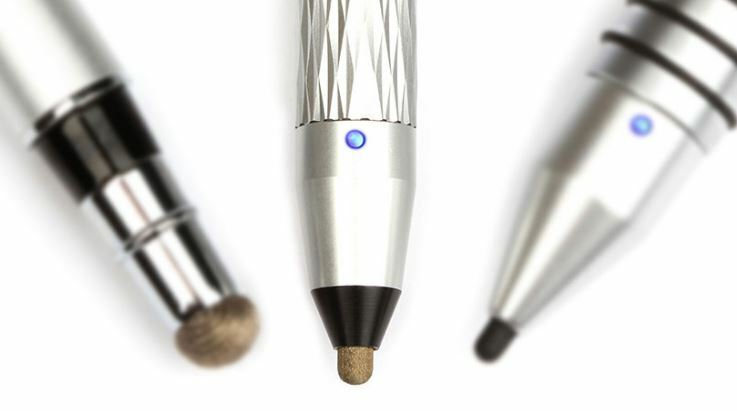 For writing and note-taking, we found this to be the most pleasant stylus to use. If you’re looking for a stylus designed for art, the Lynktec Apex Fusion provides you with a unique tip that creates a more tactile feeling. The stylus won’t last quite as long as the Dash, but you’ll find that it will make it easier to translate your artistic skill into a digital form. Plus, the expressive design is simply much more fun than the professional look of the Dash. Hi I am looking for a stylus compatible with my Dell Inspiron i57373.